For this Project, NRC developed a complete project management plan which highlighted the cost effectiveness of using a Pug Mill to stabilize Cadmium impacted soil. This management plan also specified the schedule, technical approach, and resources required to meet all the performance objectives, as well as the Erosion and Sediment Control Plan, Quality Assurance / Quality Control Plan and Health and Safety Plan. The Project involved clearing a grubbing 750LF of sloped stream bank, diverting the Quinnipiac River using dam bags, using a slide rail system for deep excavations, excavating, stabilizing and consolidation of 17,000 cubic yards of Cadmium impacted soil, site restoration including river bank restoration using Gabions, Reno Mattress and armoring. The soil excavation work followed several different elevations which were maintained be using a GPS equipped excavator. The excavated soil was processed through a screening plant then treated using a pug mill. The pug mill mixes cement and water with the impacted soil to create a stabilized soil material which is used for backfilling. Once the material is stabilized, tested and approved by the engineer it is returned to the excavation or consolidated to according to an intermediate grading plan. To facilitate the excavation services NRC used a slide rail system in areas of the site requiring shoring to support slopes adjacent to residential Properties. The slide rail system consisted on three interlocking 20ft X 20ft bays which were advanced along the length of the Property line approximately 240LF. 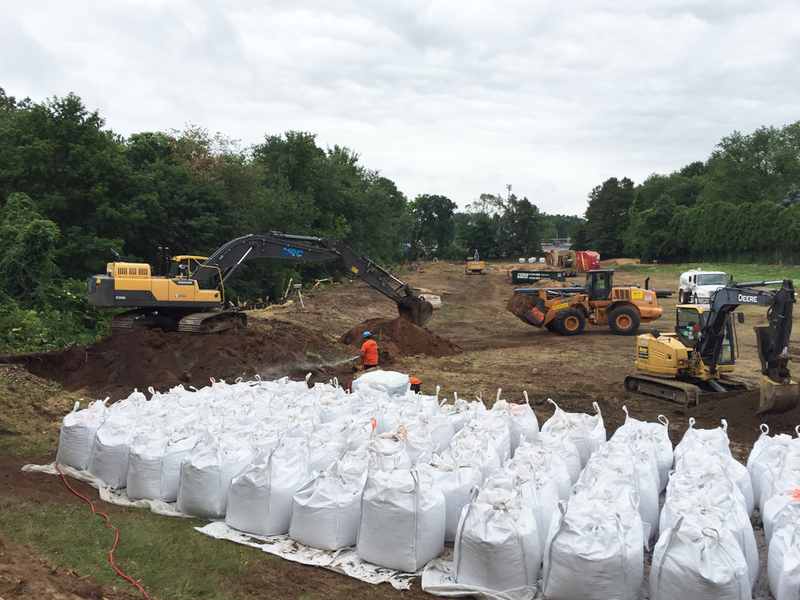 Excavation along the river bank began once NRC had filled (imported sand) and place over 1,000 dam bags. 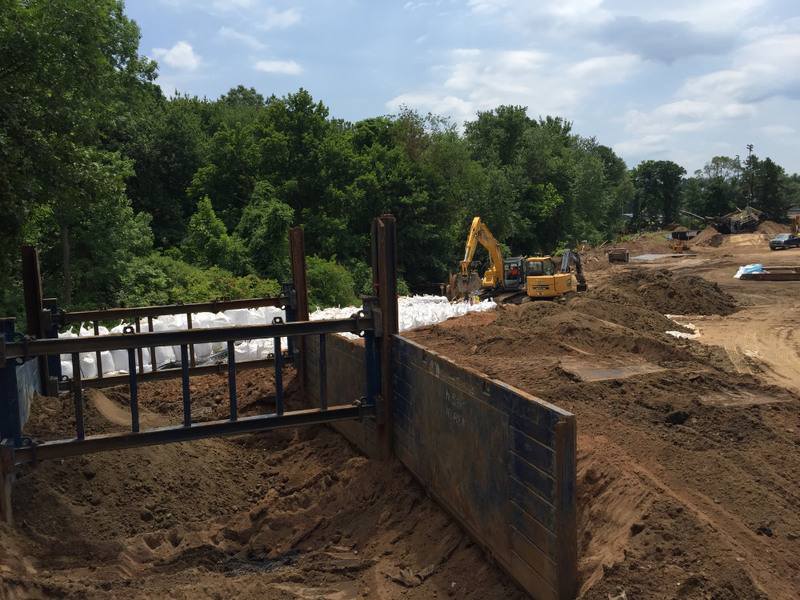 The dam bags were placed along the Quinnipiac River to allow for the excavation of impacted soil and the installation of Gabions, Reno Mattresses and Armoring. Following the river bank restoration the dam bags were removed. Groundwater resultant from the river bank restoration and soil excavation services was processed by NRC’s on-site groundwater treatment plant (GWTP). The GWTP consisted of 21K weir tank, 21K fractionation tank, bag filters, 6,000lbs of zeolite and associated pumps and hoses. The treated groundwater was either used for processing the impacted soil in the pug mill or discharged to the Town of Plainville municipal sewer system. 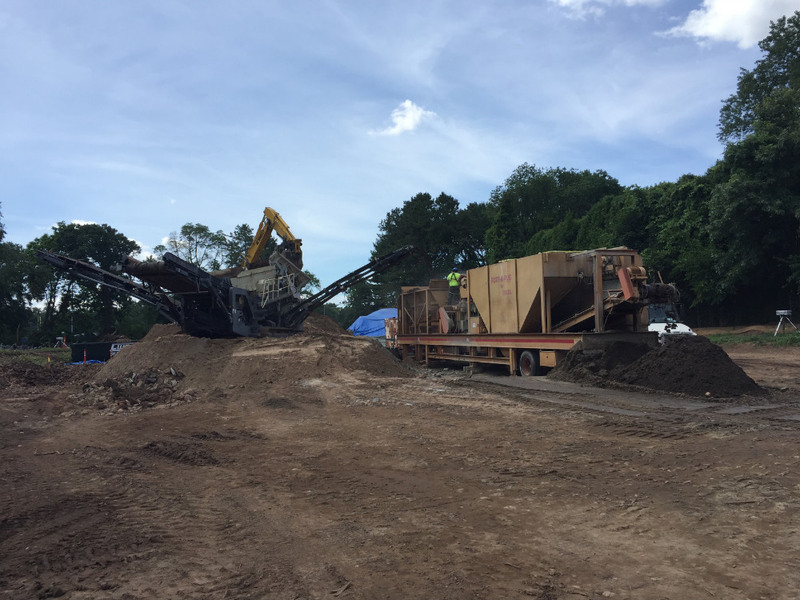 Stabilization of 17,000 cubic yards of soil using screening plant and pug mill. Stream diversion using 1,000 dam bags.